It is widely acknowledged by libraries, archives and heritage institutions that web archiving is crucial to the global mission of preserving digital heritage. The task of comprehensively archiving the World Wide Web cannot be accomplished by one institution alone and organisations such as the IIPC play a vital role in bringing together the web archiving community, and its various stakeholders, to carry out this vital undertaking. The IIPC Web Archiving Conference is an international forum which provides a unique opportunity for web archiving practitioners, researchers, developers, and those starting out in web archiving, to come together to share experience, disseminate knowledge, promote activities and network. In 2019 the IIPC WAC is proudly hosted by the National and University Library of Croatia in Zagreb, and coincides with the 15th anniversary of the Croatian Web Archive (HAW). The WAC (#iipcWAC19) will be held in the Westin Hotel Zagreb, on 6 & 7 June 2019. Proposals on all aspects of web archiving practice as well as researching and using web archives are invited. Particularly welcome are proposals related to the Central, Eastern and Southeastern European region and proposals from the perspective of new users and researchers. Posters with accompanying 5 minute lightning talks. Proposals for presentations, panels and posters must be submitted as an abstract of between 300 and 500 words. Panels are expected to reflect varying and potentially conflicting viewpoints represented by a diverse group of panelists and proposals should outline the panel agenda as well as the role of a moderator, if applicable. Proposals for workshops and tutorials should be 800 to 1,000 words and include information about coordinators, format, target participant numbers and technical requirements. Workshops and tutorials should also include expected learning outcomes. Proposals should demonstrate how the presentation, panel or workshop contributes to the general themes relating to building, maintaining and researching web archives. All proposals should be accompanied by 3 to 5 keywords. The deadline for submissions is 13th January 2019. 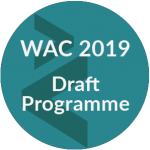 All submissions will be reviewed by the WAC19 Programme Committee and submitters will be notified by mid February 2019.